Hundreds of Moro and indigenous peoples yesterday staged a protest action in front of the US Embassy to Manila calling for the end to US intervention and plunder in the Philippines. As of latest report of Karapatan paralegals, there were 43 protesters illegally arrested, eleven of them were injured and brought to the Philippine General Hospital and Ospital ng Maynila, where policemen guarded them and further harassed them. “The police used teargas, truncheons and shields to beat them up and disperse them. The ramming of the police mobile into the crowd, with the clear intent of killing and maiming the protesters, is simply barbaric,” Palabay said. Piya Macliing Malayao, Secretary General of Katribu and spokesperson of Sandugo, a recently formed alliance of national minorities, was ran over the police vehicle, her foot was badly wounded, and was arrested together with the medics who were providing first aid treatments to those injured. Raymart Sumalbag, 23, a jeepney driver, was repeatedly whacked by policemen and was left unconscious, until he was rushed to the hospital. He is currently in critical condition. A youth activist of AnakBayan Nicole Sorya was run over by the police mobile driven by PO3 Franklin Kho. She is also seriously injured and still confined in the hospital. 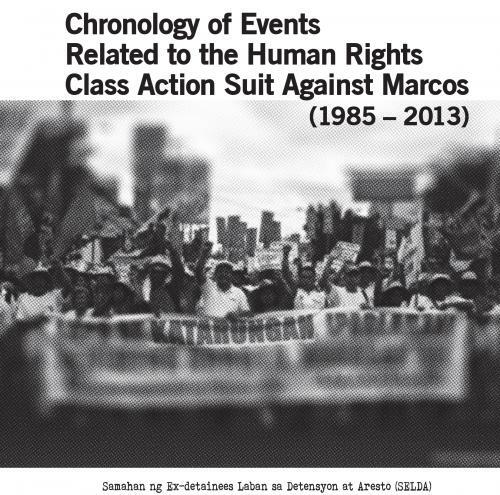 “This latest incident is a blatant display of impunity, one that prevails over a country where no justice has been rendered for victims of rights violations from the Hacienda Luisita massacre to the Kidapawan carnage. It also reflects the mendicancy of the country’s state forces to US interests,” Palabay said. “It is the national minorities who have long suffered the adverse impact of US interventionism in our country. From the robbing of our natural resources, the plunder of ancestral lands, the massacres of our Moro brothers and sisters, and now, this. It should be understood that the national minorities’ rage against the US comes from hundred years of oppression brought about by US imperialism. The red paint thrown at the US seal is a symbol of defiance and their yearning to live freely,” Palabay said. “With the right amount of US military aid, the US can dictate its terms with the Armed Forces of the Philippines and the Philippine National Police to protect US interest in our country at the expense of the lives of the Filipinos,” Palabay said. “Even the counter-insurgency programs which victimized our citizens through human rights violations were designed by the US to defend and uphold its interests in the Philippines and in Asia,” Palabay said. “We strongly condemn the Philippine National Police for doing such acts of barbarism. There is no justification whatsoever for such violence. Manila Police District deputy commander Col. Marcelino Pedrozo should be dismissed, prosecuted and jailed for giving orders to his men to conduct the violent dispersal. Police Officer Franklin Kho, who rammed the protesters repeatedly with a police mobile, pulled the hair of a Lumad woman and punched a journalist should be dismissed and made accountable for his savagery,” Palabay said. A day before the bloody dispersal, the national minorities who joined Lakbayan 2016 were also met with water cannons at the gate of Department of National Defence (DND). Lakbayan is the travel of national minorities to Manila, to voice out their call for self-determination and the pull-out of military troops from their communities. 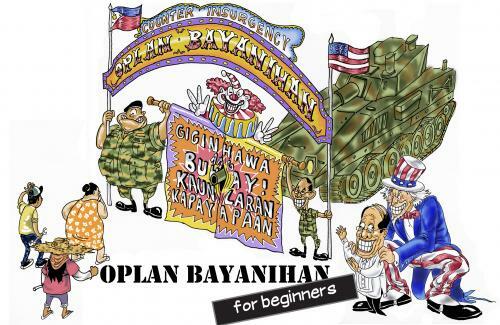 The Lakbayan protested at the DND to call for the junking of Oplan Bayanihan, the US-driven counter-insurgency program.